Annie was born in Egypt during the second World War and from the age of 4 spent her childhood in Australia and England. In the early sixties she went to St Martins where she studied Fine Art and, after bringing up a family, returned to painting. At that time she was living in Gloucestershire and taught at Stroud Art School and Prema Art Centre. A move to Wales in 1992 and a gift of two Welsh cobs inspried her to start her career as an equestrian artist. Since then Annie has won several prizes, including the Society of Equestrian Artist's Best Pastel Painting, Best Polo Painting and the Best Painting voted by the public as well as a £1000 prize from the International Pastel Artist Magazine. 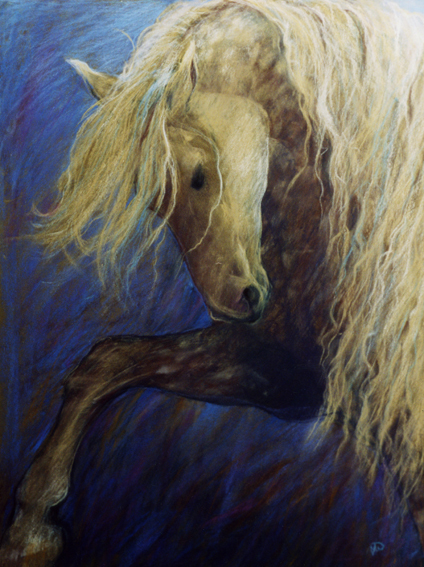 "I have loved horses for as far back as I can remember; I hope that my paintings show this passion I have for them through movement, colour and light so that the true Spirit of the Horse shines out with all its grace, power & beauty."